What is the difference between HumidX and HumidX Plus? HumidX Plus (Grey) which offers more moisture and heat within the mask. Should I use the HumidX or HumidX Plus? The first thing you need to determine is do you want to use humidification with your CPAP therapy? 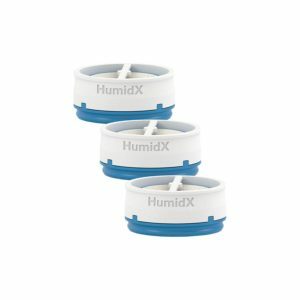 If you experience any dryness within your airway, then we advise you use humidification. In terms of choosing between the HumidX or the HumidX Plus, the best way to determine which one is the best, is by using trial and error. When you first purchased your AirMini, it would have come with one of each “strength” of humidifier. Generally, I would advise trying the HumidX first and if you require more humidity, then switch over to the HumidX Plus. Please note, that the HumidX tabs need to be replaced every 30 days. There is a lot of moisture passing through these, so we strongly advise sticking to these guidelines. Another thing worth considering is that you may want to use a different “strength” depending upon the time of year. We have had quite a few patients report back that the HumidX is more effective in the cooler months and HumidX plus more effective in summer. Can I use HumidX or HumidX Plus with the ResMed AirFit F20 Full Face CPAP mask? Unfortunately neither of the tabs can be used with the ResMed AIrFit F20 full face mask at the moment. The HumidX and HumidX Plus can be used with the ResMed AirFit P10 and ResMed AirFit N20. 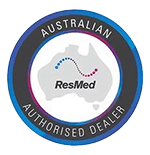 When deciding your humidity for the ResMed AirMini, first decide whether you want humidification at all. Then we suggest trialing both and see what works best for you. We believe it is a good idea to have at least one on hand of each. I only use my AirMini when I travel, which is 8-10 nights a month. It is a real pain that the HumidAir needs to be replaced every 30 days from the date the HumidAir is open. That might only be 4-5 nights depending on the month. Is there a way to preserve the HumidAir when not in use so it can last longer? Greg, unfortunately not. Because of the heat and moisture environment of the tabs, I believe it is a hygiene thing. Philipp, sorry what do you mean? In order to keep the HumidX sanitary after only a few days’ use, can one freeze it? Bacteria shouldn’t grow in the freezer? Philipp’ very good question. I will need to find out. I use the air mini when traveling. I don’t use the humid because it is too loud for my wife. Is there a solution? Hi Jon, Unfortunately there is not a lot we can do about it. Do you notice much difference in noise between when you are using the HumidX and not using it?